Vaccinia virus is known for its use in smallpox vaccination, but following the eradication of smallpox, routine vaccination is no-longer performed. Recent interest in Vaccinia has centred on its potential use as a vector for immunization against other viruses, with a focus on developing less virulent strains than those used for vaccination against smallpox. The Native Antigen Company offers a recombinant Vaccinia protein that demonstrates biological activity as a Type I IFN receptor. Vaccinia virus is a large, complex, enveloped virus, belonging to the Poxvirus family. Poxviruses are unique among DNA viruses, as they replicate only in the cytoplasm of the host cell, outside of the nucleus. Therefore, a large genome is required for encoding various enzymes and proteins involved in viral DNA replication and gene transcription. The close similarity of the Vaccinia virus to smallpox virus led to its use as a vaccination to prevent smallpox. Infection by Vaccinia in healthy individuals is generally asymptomatic, but may present with a mild fever and rash. It does, however, produce lasting immunity against other pox viruses, including smallpox. 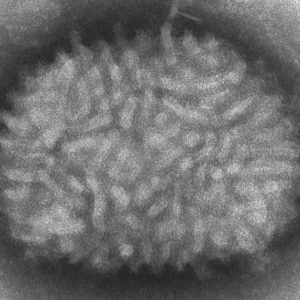 Vaccinia virus has therefore been used as a live vaccine against smallpox, and although now not widely used, it remains in use for healthcare workers, the US military, and researchers working with pox viruses. The use of the vaccine is associated with very rare but severe side-effects, primarily in immunocompromised individuals. We offer recombinant Vaccinia virus B18R protein, which contains two Ig-like C2-type domains and one Ig-like V-type domain. Vaccinia virus B18R exists in a soluble and membrane-bound form. As a type I IFN receptor, B18R counteracts the antiviral effects of host IFN-alpha/beta. The B18R protein also acts as a soluble IFN-alpha receptor and thus, inhibits the interaction between host IFN-alpha and its receptor. B18R was recently shown to enable increased cell viability during RNA transfection protocols, designed to convert human somatic donor cells into iPSCs.